A commonly used practice in industry is the machining of sculptured part surfaces on a multiaxis numerical control (NC) machine. While this practice is vital, it is also a costly aspect of the surface generation process. 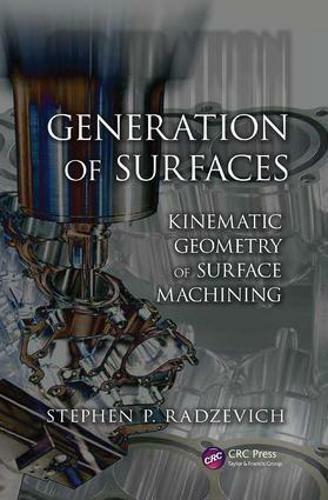 After investing more than 40 years of research into the theory of part surface generation, the author of Generation of Surfaces: Kinematic Geometry of Surface Machining considers an approach that provides optimal machining while factoring in the lowest possible cost. This book presents the modern theory of part surface generation with a focus on kinematic geometry of part surface machining on a multiaxis (NC) machine, and introduces key methods for applying the DG/K-based approach to part surface generation. The DG/K approach is based on the results of research found in two main areas: differential geometry (DG) of surfaces, and kinematics (K) of rigid body in three-dimensional Euclidian space E3. It is an extremely powerful tool for solving a plurality of problems in mechanical/manufacturing engineering. The text is presented in three parts: the basics, the fundamentals, and applications of part surface generation. The first part of the book provides an analytical description of part surfaces, details the principal elements of the theory of multiparametric motion of a rigid body in E3 space, and defines applied coordinate systems. The second half introduces the theory of part surface generation, and includes an analytical description of contact geometry, while the final portion illustrates the potential development of highly effective part surface generation methods. The author illustrates the most complex features of the book with examples, explains all of the results of analysis mathematically, and uses just one set of input parameters-the design parameters of the part surface to be machined. The book considers practical applications for part surface machining and cutting tool design. Developed for use with computer-aided design (CAD) and computer-aided machining (CAM), this text is useful for anyone starting work on new software packages for sculptured part surface machining on a multiaxis NC machine. ... the investigation of the problem of synthesizing of the most favorable processes of part surface generating is the main strength of the book by Dr. Radzevich. ... It should be stressed here that the problems of synthesizing of something are commonly recognized as the most difficult problems in science, and in engineering in particular." "This is a nice systematic approach. ... extremely important for scientists and engineers..."